Dotcom won't be standing for office, and we don't know who Megaparty will field as candidates. 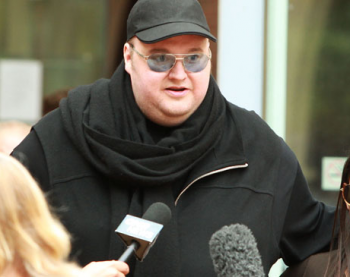 "Where the government is supposed to serve us the people, we are paying with our taxes that they do a good job for us," says Kim Dotcom. "But look what they do, they undermine our rights, they destroy our freedoms, they censor our internet, so we are the ones who have to bring that change." So the beleaguered internet entrepreneur, who has yet to have his extradition hearing, has formed a political party, Megaparty, which will contest the next New Zealand general election. An app will launch January 20th, and when it does Megaparty will start signing up members. Dotcom is prohibited from standing as a candidate, as he is not a citizen of New Zealand. He has yet to announce Megaparty's candidates, saying that for now it's better to keep their names under wraps, as a surprise for the launch. Dotcom intends to target what he describes as the "internet electorate," as well as all the non-voters, to "make politics exciting." In the last election, nearly 1 million eligible voters chose not to participate. It's likely, political observer and University of Otago lecturer Bryce Edwards points out, that Dotcom's party will throw a spanner in the works at this year's general election. It probably won't win office, but it will take support away from the other parties, particularly Labour and the Greens. Moreover although Dotcom can't stand for office, that doesn't prevent him from leading his political party. "[Dotcom's] libertarianism is not so much of the economic kind, but of the social kind - the belief that the state shouldn't be concerned with the public's personal lives," says Edwards. "Such social libertarians typically promote the abolition of laws against recreation drug use, the abolition of censorship laws, but are particularly strong against forms of state surveillance against citizens." To get a seat in parliament, a political party needs to get at least 5% of the vote, a target Dotcom is determined to reach. According to Dotcom, over 15,000 tickets have already sold for his party's launch event. "Moving to Vector Arena now. This will be EPIC."